We could have a good debate about who has the most challenging climate to garden in. Other than those who live on “the fringes” in climates that barely sustain life anyway, I’m sure we would all make a good case for our own particular challenges. Here in the Midwest, we are challenged by hot summers that offer many days in the upper 80’s and low 90’s with high humidity, and cold winter nights that can see temperatures dip below 0 F. And the ground can freeze and thaw all winter long. We soon find out that not every perennial flower likes our growing conditions, even if we find that perennial for sale at a local garden center or big box store. 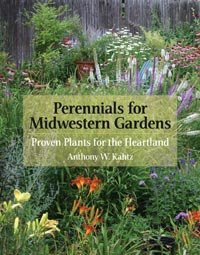 That’s why I was pleased to get a copy of a new book on perennials, Perennials for Midwestern Gardens: Proven Plants for the Heartland by Anthony W. Kahtz. Browsing through this book, I looked up plants I know well from my own garden, like Amsonia tabernaemonta, which I call Blue Dogbane, but Kahtz calls Willow Blue Star. I like that better as a common name, so will call it that in my own garden. I also read with great interest his advice for growing Delphinium hybrids, which should help me in my quest to get these to thrive around here. I then checked out some perennials I haven’t grown before, like Echinops ritro, Globe Thistle. I am good at growing common weedy thistles, so I should do well purposely growing a “thistle’ that has some ornamental value, not to mention blue flowers. I like how Kahtz has presented each plant in this book, with a picture, a little fact box with hardiness zone, origin, height, spread, use, season of bloom and key characteristics, followed by his own thoughts and advice and some varieties to try. Kahtz included 140 plant profiles in this handy reference book, some for old familiar perennials, others for perennials new to me, and all for perennials that will do well in the challenging conditions here in the Midwestern states. While these clearly aren’t all the perennials that will grow in the Midwest, it’s a long list and even just following it, you could end up with a lot of variety in your garden. This is a welcome addition to my library, a good book to have close at hand for reference whenever I’m looking for new perennials to grow in my garden. It would be good for any gardener in USDA hardiness zones 3 - 6, in Michigan, Ohio, Illinois, Wisconsin, Iowa, Missouri, along with Indiana. Carol, I bought this book about a month ago after seeing an article about it in our local newspaper. I had thought about writing a review of it myself, but procrastinated...and I wondered what expert gardeners like yourself would think of it. Glad to know you have found some useful information in it, too. As for me, the novice gardener, I think it's a great reference book. I like that all the plants are accompanied by a photo. And I find myself thumbing through it again and again to get ideas for more native plants in the garden. Great review; I second your recommendation for this one! Sounds like a great book to reference for your garden zone. I am adding that Echinops ritro 'Globe Thistle' to my garden this fall. It looks like a great plant. Regardless if the tag says one zone higher than ours, I just have to try it out. Sounds like a good one to have Carol. Thanks for the review! I recently got the Sunset Midwest Landscaping Book, and Illinois Garden's Guide. I definitely enjoy having some gardening references on hand that are specific to the local climate and highlight local natives as well. Your pick sounds like another good reference to add.